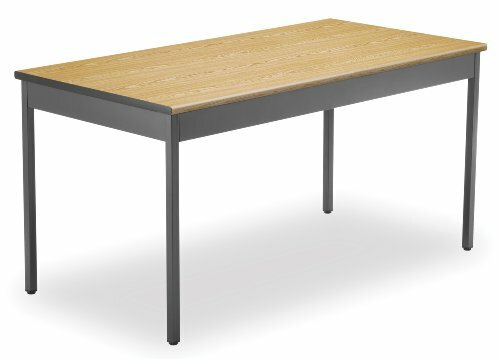 OFM utility tables make a perfect addition to any office, school, library, industrial, or hospitality environment. With its contemporary design and Bullnose edge top, this table will blend with any decor. The high pressure laminate top provides a durable and long-lasting work surface. And your OFM utility table will hold up even with intense use, thanks to the heavy duty 15 gauge steel frame and scratch-resistant finish. Leveling glides are also included on all four legs ensure stability and protect floors. Available in multiple sizes and tabletop finishes to fit your specific space and style requirements. 30" d x 60" W x 30" h. This UT3060-OAK-OFM meets or exceeds industry standards for safety and durability, and is backed by OFM limited lifetime warranty.